Our luxury hotel shower curtain has been a top seller in hotel and resorts world-wide. Featuring a pique woven pattern, our shower curtain is 100% polyester and includes a patented built-in split ring that allows for easy installation and removal without ever removing the rod. 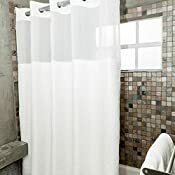 The fabric shower curtain liner is attached with snaps for easy removal, and is machine washable to easily remove allergens, mold, or fungus that tends to grow on traditional shower curtains. This shower curtain was designed to help keep your bathroom clean and free of airborne allergens that can be harmful to your health. Our luxury shower curtain is the perfect accent that'll work with any décor - 100% polyester built in with easy snap removal shower curtain liner protects fabric from mold and mildew. The fabric shower curtain liner set is machine washable for easy care. Classic white shower curtain - great for any season or holiday! Bedding, Bath, & Sleepwear Experts - With 40+ years of experience in the hospitality textile industry, our parent company Valley Forge, formed a partnership with Lenzing AG to create a sustainable eucalyptus fiber Tencel+PlusTM Lyocell. Living Fresh bedding, bath, and sleepwear is a rare combination of luxury and health. Patented split ring for easy installation and removal. Removable liner with simple, quick snap removal for an easy wash.
Machine washable curtain - prevent allergens, mold, & fungus. Classic white, pique woven pattern perfect for any season or holiday. Originally designed for luxury hotels & spas - mildew resistant.